With all of the fundraising and other expenses of F.B.I., do you ever wonder, where does all that money go? Well, all non-profit youth organizations, including F.B.I., cost money to run. And all leagues require fund-raising and sponsorship to run them. 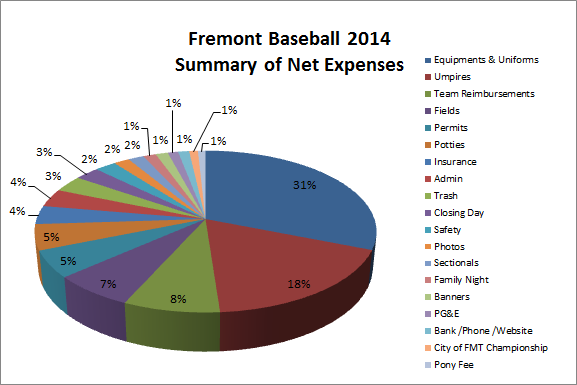 Here is a summary of Season 2014 Net Income vs. Net Expenses as pie charts. These are just a few things (though certainly the biggest ones) that make this league possible. Leagues like F.B.I. are run by volunteers. You and other volunteers can help make the difference in a young players life. Please contact us if you would like to join the effort. Thank you.